So I've been watching videos and thinking bout how, and yesterday I finally busted loose and bought some Tobacco Leaf. Gonna be a Brother Of The Roll Your Own Leaf. Hunted up an ulu from the kitchen store today (looks exactly like the chevette they sell at the cigar leaf place), scored a rolling pin, and bought RedHead a new bamboo cutting board which I swapped for her old maple board. I'll get a copper pipe fitting from **** Despot to cut caps. Then all I need is some gelatin for glue, and I'm equipped. I expect to roll them this month and let them set six months. Will brew up some porter in October and set that away. Somewhere around playoff time, anyone wants to come over, we'll open the windows, fire up the wide screen, decant some home brew and fire up some home rolled. Brother, if you got the Eagles on, I just might take that invite. Best of luck to you!! I'll be right over, wearing my Roger Staubach jersey. I'm in even though I'm boycotting the eagles till they get rid of Reid!! Please share pics of the smokes as you roll them!!! Great idea!! Leaves ordered Friday afternoon. Arrived Tuesday afternoon. Pretty decent service. I like internet shopping. I am excited to see your progress! If you don't mind, will you post the cost of all that you are getting so we can see what the investment would be to try this? Current estimates are that I will extract forty to fifty robustos from this much stock. The sixth one, at the bottom, still has c.com catalog paper wrapped round it, to try to make it rounder. What a delectable aroma! The garage doors were open, thunderstorms blew damp air through, I had arena football on the garage toob, a good time all around. But the big thing was the aroma. It reminded me more than anything of cigar.com house blend sungrown. That, the cameroon, and the purple are my three favorite c.com house blends. My hands were full of that exact odor. In fact, I lit up a c.com sungrown as soon as I was done, just to verify the truth of the assertion. It is true. Hope they come out tasting half as good. Fooling with the aroma was just as delicious as enjoying a good cigar. And the stinkfinger afterwards was pungent as well. Next day, I went sailing, anchored in a cove, and smoked a MOW under the stars in the cockpit, and rated it five stars. I would rate this rolling experience in the garage just as high. My ability had better improve dramatically. 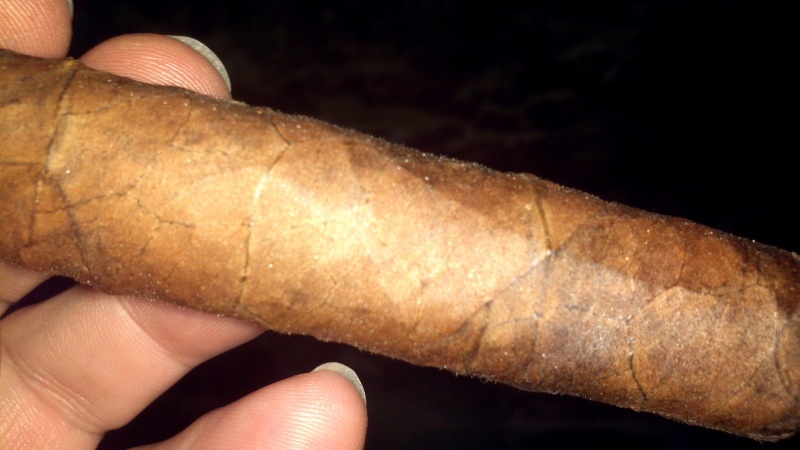 I get great pleasure out of admiring the artistry in a well constructed cigar as I smoke it. These knobby twigs offer none of that. On the other hand, I did make great strides even from the first to the next. I had fully expected consistency to be a great problem. I am happy to report that it was easy to avoid soft spots. After the first stick, I think I got entirely satisfactory and consistent tightness. Not so tight as I will get them I am sure, but tight enough to start. I expect the next six to come out even better. Length and girth are good. Consistency is darn good. Firmness is getting there. Now if I can just get them to look like that. I don't know why this is important to me; but I am certain you BOTLs can agree that the artistry is an important element. I do admire the marbled appearance I managed to get. That's it. They're in the box, the box is in a plastic bag, the whole package is in the freezer. I figure three days there ought to kill any bugs. I don't want to introduce bugs to my humidor. 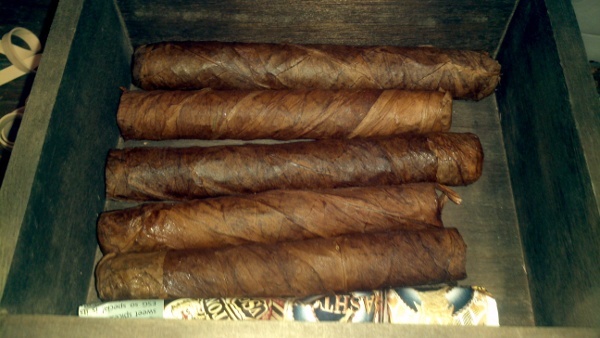 Once they come out of the freezer, I'll let them rest in the box until humidity gets right, then pop them in the humidor for at least a couple months. They will get burnt. I gar awn tee. Web, that is one of the coolest things I've seen!!! Thanks so much for sharing! I'd love to trade you outta a couple of those as well, just to see how they taste! This is definitely on my things to try list!!! Well, I've gotta ask. I've read these posts and googled 'botryol' and I still don't know how the name of your thread relates to its content. Sometimes us oldfarts are just dense, I guess. Could you 'splain it for me, please? Brother of the roll your own leaf!!! LOL, yeah took me a sec too! D'oh! I'da never figured it out. The closest I could come was a botryoid cyst meaning shaped like a cluster of grapes. I don't think his cigars look that bad... LOL. Hahaha, yeah, I think they're amazing looking and think Im going to try this out myself. I need to do a little research on what to use where, but by the end of the year, I'm going to try this for sure! Thanks Web! I am getting good consistency, even construction, tighter binder, tighter wrap, and a better shaped cap. I do not use a mold -- I strictly shape them by hand. I am aiming at robustos, but they seem to come out more of a lonsdale.. I think at this point my biggest problem is wrapper quality. I am sure the best leaves don't get shipped to the place I buy from. The stuff I have to use is very tough to spread smoothly. After a few months to age, we'll know whether they are worth lighting. Looks delicious to me BRO!!!!! Couldn't wait any longer. Fired one up last night. One of my first, so ugly, but at least it's three weeks old. Blech. What a disappointment. Filler was aged Dominican seco; binder was CT broadleaf; wrapper was another variety of CT broadleaf. Couldn't taste any one of them. At all. The burn was good. Draw was a bit tight; but I had feared draw would be too loose, so that's not bad. Gauge was good, with a good volume of smoke. But the flavor just was not there. Wrapper bland under the tongue, smoke bland in the mouht. If I had to identify the flavor at all, what I could taste of it, I'd say it tasted like cigarette tobacco, but without the paper and million chemicals. Like the old Bugle tobacco I used to roll for Dad and snitch for myself. It's a satisfying enough hobby. But if I can't get more flavor than this, then heck with it. Got to find some better leaves. Sorry to hear that! Any chance that they will get more/better flavor with time?